Technical plastics compounder Luxus will be promoting the benefits environmentally positive polymers can deliver to Welsh manufacturers at a WRAP Cymru event on the 17th November 2017 at the Swalec Stadium, Cardiff. 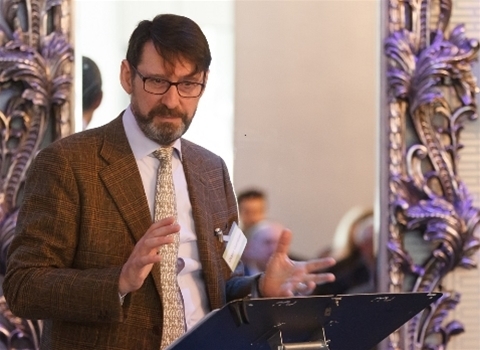 The event, ‘Forming the Link: A Resilient Supply Chain for Plastics Manufacturing in Wales’, will be chaired by WRAP director, Peter Maddox and will also feature presentations from its sector specialist, Bernard Chase along with Luxus managing director, Peter Atterby. “Luxus is delighted to be invited to speak at this event, the Welsh auto component industry has enjoyed sustained growth in recent years. It will provide a great opportunity therefore, for Luxus and fellow industry experts to dispel the myth regarding the perceived quality of recycled content polymers compared to prime alternatives. “We will focus on the critical role environmentally positive polymers now play in supporting global auto interior component design, to deliver greater fuel efficiency and lower CO2 emissions while also satisfying automakers’ need to reduce the carbon footprint of vehicles. “The adoption of our advanced lightweight polymer range Hycolene™ with up to 60% recycled content for example, can lead to a 12g weight saving on a single component in one model. This would mean CO2 emissions reducing by more than a 1000 tonnes, over the course of the model’s life-time. “But most importantly, its use will also increase the volume of recyclate that can be used by the automakers, which means a reduction in the amount of virgin polymer manufactured – therefore preserving limited natural resources.” Said Peter Atterby, managing director, Luxus. In March this year Luxus also announced it had acquired South Wales based additive and masterbatch specialist, Colour Tone. The company is known for its pioneering work with WRAP to address the problem of black food packaging waste. Black plastic packaging contains carbon black pigments which absorb infra-red light and cannot therefore, be optically sorted by equipment with near infra-red (NIR) detection technology used by recycling depots. Colour Tone responded to this challenge by developing an alternative detectable infra-red detectable (IRR) colourant that enabled black plastics to be visible for NIR sorting. 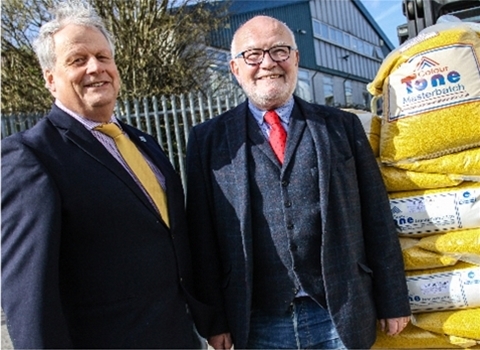 Luxus has since as part of a new consortium with industry partners Polykemi and One51 gained a £1.29m investment from the EU Horizon 2020 research and innovation programme to advance further the development of this novel IRR colourant for both black and coloured plastics waste. The commercialisation project known as NIRSort, will develop a range of IRR colourants that will be tested in numerous applications beyond black food packaging, these include automotive plastics components and consumer durables such as home appliances. The aim is that the IRR colourants will be specified by manufacturers for new products, but at the ‘end of life’ these same products can be easily separated into individual plastic polymer streams via automatic NIR sorting for the first time. 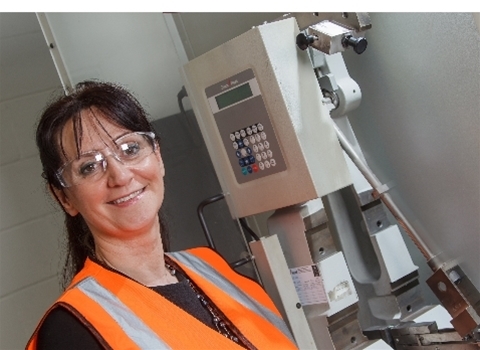 UK leading independent technical plastics compounding and recycling company Luxus has been developing highly specified thermoplastics compounds based on prime and recycled feedstocks for over 50 years. Luxus is a key supplier to the major names in the global auto industry and it was the first and still is the only UK business to achieve approval for its recycled grades in car interior trims. Technical compounder Luxus will be showcasing its high-performance PP based compounds range, able to deliver technical properties to rival some more expensive engineered polymers in demanding auto interior components. All on stand E50 at the Engineering Design Show, 18th-19th October 2017. Peter Atterby, managing director, Luxus explains: “We believe that modern PP compounds will encourage auto engineers to completely re-think their materials choices. The adoption of advanced additives means that PP based compounds can now be used where previously the technical properties of the application would have demanded costly ‘off the shelf’ engineering polymer. “The ‘off the shelf’ (unmodified) polymer is currently chosen at the design stage, since it offers a known performance - despite some properties being irrelevant to the application itself. This means that when cost considerations come into play later, there is an option instead to create a workable, yet more economic PP compound that is tailor-made to component specifications. The industry’s need to satisfy increasing targets set by ‘end-of-life’ vehicle (ELV), producer responsibility regulations are also being addressed by Luxus. The compounder has recently secured £1.29m investment funded by the EU’s Horizon 2020 research and innovation initiative to commercialise a range of novel near-infrared (NIR) detectable colourants for adoption in automotive applications and other markets. Luxus leads a consortium for the commercialisation project known as NIRSort, with support from fellow Nordic polymer processing partner, Polykemi and global plastics manufacturer One51. Each year 3.5 million tonnes of polymer are scraped in the UK alone, since black and some other coloured plastics cannot be picked up by recycling sorters. As these products contain carbon black that reflects very little or no radiation rendering it ‘invisible’ to sorting machines in recycling plants. Adoption of this technology will enable NIR sorting operations to segregate black and coloured plastics they produce from streams to a purity that they will be useable in highly engineered polymers. This will allow manufacturers to meet their obligations, reduce landfill and contribute to lifecycle analysis requirements too. Finally, Hycolene™ an environmentally positive, advanced lightweight, scratch resistant thermoplastics range developed for Class ‘A’ auto interiors will also be showcased. The range is low density, while offering up to 60 per cent recycled content with the option for prime grades too. Hycolene™ satisfies the rapid cycle times now set by OEMs and Tier 1 manufacturers while delivering at the same time significant Co2 reduction benefits. 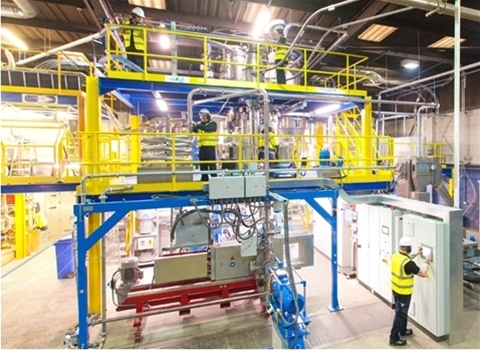 UK leading technical compounder Luxus has this month, as part of a new consortium, with fellow Nordic polymer processing partner, Polykemi and global plastics manufacturer One51 secured a £1.29m (€1.47m) investment, co-funded by the European Union’s Horizon 2020 research and innovation programme (under grant agreement No 760642). The funding supports NIRSort, a new commercialisation project that aims to replace carbon black and many other pigments with a range of novel near-infrared (NIR) detectable alternatives for adoption by Europe’s packaging, automotive and consumer durables manufacturers. Each year 3.5 million tonnes of polymer are scrapped in the UK alone, since black and some other coloured packaging cannot be picked up by recycling sorters. As these products contain carbon black that reflects very little or no radiation rendering it ‘invisible’ to sorting machines in recycling depots. This two year project will be led by Luxus in collaboration with global processor Polykemi. Polykemi will participate by formulating, processing and testing materials. The resulting materials will be then further evaluated for use in innovative packaging material via Polykemis subsidary, Scanfill. The third consortium partner is rigid plastics manufacturer, One51 selected for its injection moulding manufacturing expertise. Dr Christel Croft, technical director, Luxus, explains: “This pioneering project is based on the previous successful work to identify NIR detectable alternatives to carbon black from specialist additive and masterbatch supplier, Colour Tone whom Luxus acquired earlier this year. “It aims to develop a range of colourants for polymers that will enable NIR sorting operations to segregate black and coloured plastics from waste streams to a level of purity that they are useable in highly engineered polymers. Potentially even in our light-weight, high scratch-resistant polypropylene (PP) compounds range, Hycolene™ for example. · Extended Producer Responsibility (ERP) regulations - increasing the responsibility for the supply side to identify the materials they provide into commercial streams; extending this responsibility through to the point of recycling. · Stringent recycling targets are forcing recyclers to process increasingly difficult materials that they could formerly lose as scrap. · Increased volumes and high labour costs are moving the industry to reduce manual segregation and increase shredding; this requires more sorting facilities so cost becomes an issue. According to the ERP regulations, ‘obligated businesses including retailers, brand owners, packaging convertors and fillers are responsible for obtaining evidence that plastics packaging recycling has taken place’. The routine failure of these plastics to be identified and recycled presents an urgent problem for producer industries in their efforts to comply. The most immediate market need is for food packaging, which typically has a three to 12 month cycle from ‘make-to-waste’. While waste from consumer durables goods (WEEE) however, has a mean-life of five years and ‘end-of-life’ automotive vehicles (ELV) 13 years, both also require solutions to prevent the continued build-up of potentially unrecoverable polymers. Black plastics alone represent around five per cent of packaging (one million tonnes) and 30 per cent of WEEE* and vehicle polymers (two million tonnes), none of which can be recycled. A further million tonnes of coloured waste containing carbon black is also lost to landfill or incineration in the UK each year. 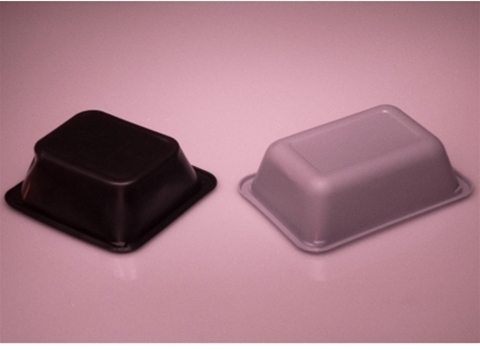 Supporting image – Black PET food trays featuring the novel near-infrared detectable colourant. Technical plastics compounder Luxus has expanded its operations with the recent acquisition of the South Wales based Colour Tone Masterbatch Ltd.
Colour Tone Masterbatch currently employs 50 staff with a turnover of £5m. This innovative additive manufacturer focuses on the delivery of high quality service and bespoke colours, in universal, commodity and engineered polymers, as well as custom additive blends. The acquisition will enable a strategic realignment of the businesses allied with improvements in production capabilities at its site in Bedwas Caerphilly. Tony Gaukroger remains as a non-stock holding Director and the company will continue to operate autonomously as before. Peter Atterby, managing director, Luxus, comments: “We are delighted that Colour Tone Masterbatch is now a part of Luxus. This strategic investment is a natural progression of our 20 year working relationship. It will enable us to significantly enhance our offering to deliver highly engineered coloured polymers that our global client base requires, providing the strongest possible market position." In recent years, Colour Tone Masterbatch was selected to support a WRAP funded project that aimed to develop the materials technology required to substitute carbon black pigment commonly used in black food packaging with infra-red reflection (IRR) black pigment. Since recycling sorting systems are unable to detect black carbon as it reflects little or no light at all. This results in over one billion black plastic trays being sent to landfill or incinerated in the UK each year. Peter Atterby continues: “The project validated that IRR pigments could allow near infrared (NIR) spectroscopy to sort black plastic packaging waste. They reproduced as near as possible the shade and opacity of carbon black, instead of the less commercial ‘brown black’ achieved in previous trials proving that materials technology can deliver a solution to this serious landfill issue. “We now have the opportunity to capitalise on the technological synergies in both companies. Since the original NIR project, a new masterbatch with the same IRR pigment has been devised for numerous applications including the prevention of heat build-up for example. This provides the opportunity to shape the technical properties of thermoplastics used for auto interior components including steering wheels, seats and instrument panels for example. This is just one of the opportunities this strategic acquisition will make possible. By combining the technical strengths of the two companies it will result in more innovative new products to cater for emerging market and client needs. Technical compounder Luxus celebrated yesterday the completion of its €1.4m Recyclite project, co-funded by the EU’s Eco-Innovation initiative, at the Brackenborough Hotel, Louth, Lincolnshire. The three year project to help commercialise its environmentally positive, advanced lightweight, scratch resistant thermoplastics range for Class ‘A’ auto interiors will come to an end later this month. Luxus along with its fellow project partners - Tier 1 moulder International Automotive Components (IAC), major auto manufacturer Jaguar Land Rover and bespoke twin screw manufacturer Coperion have helped support the development of the Hycolene™ thermoplastics range through a series of technical trials – proving the technology’s potential at full commercial scale. Underlining the need for eco-innovation entrepreneurism in Europe on the day was guest speaker Didier Gambier, head of department, Department B – LIFE and H2020, Energy, Environment, Resources, The Executive Agency for Small and Medium Sized Enterprises, The European Commission. While Matt Croucher, environment manager, The Society of Motor Manufacturers and Traders (SMMT ) focused on the UK market with highlights from its ‘2016 New Car CO2 and Automotive Sustainability’ reports, confirming that new car emissions had hit their lowest ever levels. Launched in 2008 the Eco-innovation initiative was part of the EU’s Entrepreneurship and Innovation Programme (EIP), set up to support innovation among SMEs and to improve their competitiveness. It helped to bridge the ‘gap’ between research and the market. Luxus technical director, Dr Christel Croft explains, “We’re pleased that the commercial potential for Hycolene™ was recognised by the EU and our fellow project partners three years ago. This crucial investment and the dedicated industry expertise it required, has enabled us to make a fundamental step change in our technology, as we have replaced filled compounds with ‘next generation’ reinforcing additives. “Offering excellent tensile properties these additives do not detract from the appearance of a moulded compound, yet their adoption reduces weight by up to 12 per cent per part and significantly improves scratch resistance too, satisfying stringent industry standards. Looking ahead Luxus will be developing additional Hycolene™ grades, including an even higher impact version with excellent scratch resistance and further colour options. Its capacity to produce the new compounds will be helped in the future by working in close partnership with both local and global sources to access (PP) recyclate – the same lightweight performance can be achieved too in prime grades. Luxus managing director, Peter Atterby said: “This project has enabled us to become a true ‘Eco-innovator’, Hycolene™ produces 26 per cent less CO2 per tonne over the life cycle of the vehicle compared to virgin compounds for example. By helping to also preserve limited natural resources, we are reducing the vehicle’s carbon footprint and contributing to automakers vehicle ‘life cycle analysis’ requirements. As we inevitably move towards a future legislative regime that will include more than simply tailpipe emissions alone. “Our advanced thermoplastics technology, developed for Europe’s auto interior applications is of benefit to many diverse global markets too. We’re developing an extrusion grade to bring the advantages of Hycolene™ to the heavy equipment industry, such as earth moving machinery manufacture to coaches, buses and HGVs for example. Advanced lightweight scratch-resistant thermoplastics (PP) range Hycolene™ engineered by Lincolnshire based technical compounder Luxus, has recently satisfied rigorous accelerated materials performance trials with Tier 1 moulder IAC*. These latest trials conclude the material validation process required for Hycolene as part of the €1.4m Eco-innovation funded Recyclite commercialisation project (www.recyclite.eu). The aim was to provide a theoretical equivalent of real-time ‘vehicle life’ for Hycolene (grade 16818), to satisfy fellow project member, Jaguar Land Rover’s engineering standard. The materials trials followed previous positive performance, delivering high scratch-resistance; lightweight benefits and a rapid cycle time in the spring of this year. The chosen ‘A’ class interior test component for this latest trials was a current Jaguar Land Rover instrument panel (IP), which was exposed to in market service temperatures expected for IP assemblies, for several weeks ending in June 2016. The tests were managed by IAC’s laboratory and an independent test house which compared the results against an industry standard thermoplastics grade. 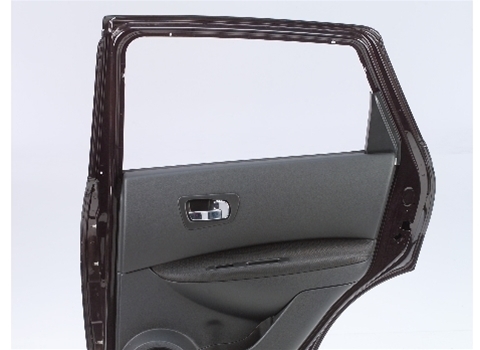 Accelerated material tests were completed as auto manufacturers require all interior plastics components to be more resistant to sunlight and heat as part of an overall goal of achieving a 10 year vehicle life. Weathering requirements have also become more severe as larger, aerodynamic windshield designs for example, have increased the sunlight exposure of many vehicle interiors today. Luxus technical director Dr Christel Croft explains the trial process: “Firstly, we took panel gap measurements both pre and post-tests to determine if there was any degree of component movement. UV resistance was also critical, with only minor fade allowed and no other colour tone change. A non-uniform colour change was unacceptable in these trials – Hycolene 16818 passed all the agreed criteria.